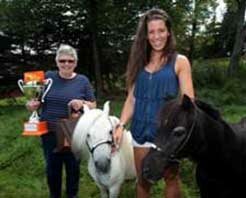 Barb Lowe of Sackville, Nova Scotia and her sweet prize winning miniature horses. What do the candy treats, Reese-Minis have to do with horses? The company figured out a sweet way to celebrate Canada’s Tiniest treasures with the Reese Minis Perfectly Tiny Awards. The Awards celebrate Canada’s Perfectly Tiny things and among the awardees is Bowlin Farms, a family run miniature horse farm in Sackville, Nova Scotia. Barb Lowe, of the Bowlin family accepted a cool trophy, a year’s supply of Reese Minis and of course, bragging rights.